Sai Devotee Monika Gupta from UK says: Om Shri Ganeshay Namah! Om Sairam! Hello to all Sai devotees. I am one of the small devotees of Baba, living in Manchester U.K. With Baba’s grace only my every dream has got fulfilled till now: my home, health issue, my baby, my job and many more which I can’t list here. Thanks Baba for all this. Though we make mistakes but Baba never leaves us instead always cares like mother and each time He makes us remember what is right and wrong, where we did mistake and also how to correct them. I again thank God for giving me Baba as a Mother, Teacher and Friend. When I got in Baba’s feet in 2014 December, till now my every wish has got fulfilled by Baba. Thank You so much. Coming to my experience during Mahaparayan. I have two experiences to share. My first experience is related to my 15 months old baby’s health problem. Second is related to my allocated chapters. Sai Devotee Soumya T from India says: Om Sairam. This is Soumya, a very minute devotee of Baba. I would like to narrate my experience with Baba related to Mahaparayan. Before that I would like to thank Hetalji, Poojaji , each and every devotee who are part of Mahaparayan. Now coming to my experience, In the month of September, as per Pooja ji's words, I had started enrolling devotees to Mahaparayan. 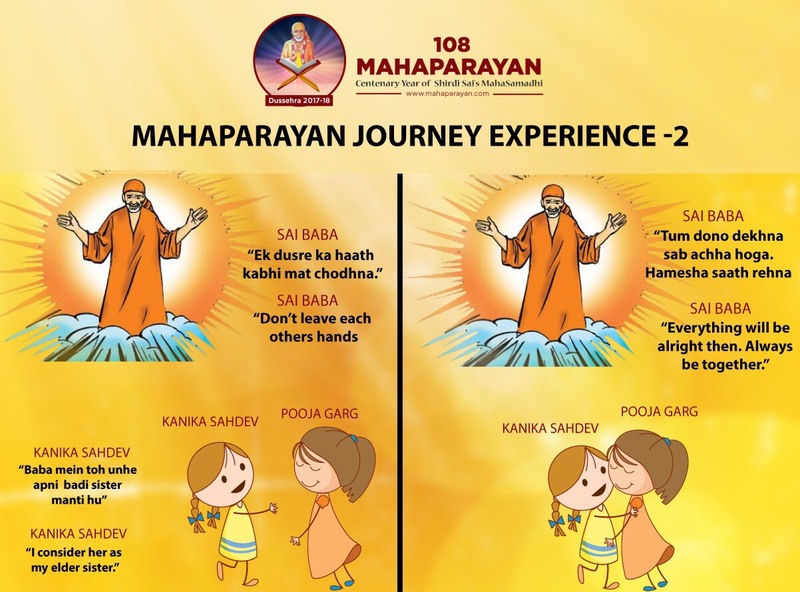 Whenever I used to talk to a devotees regarding enrolling in Mahaparyan, I would explain the complete process and finally would say, this would solve our problems and give us happiness and peace. Baba was patiently watching all this and may be smiling at my stupidity. Finally He said me the below words in my sleep: On Sep 21st Thursday afternoon, I heard a voice from Baba in my sleep as below "Who said Mahaparayan is only for Human beings, it is also for Sakala Jeeva Jantu Koti". 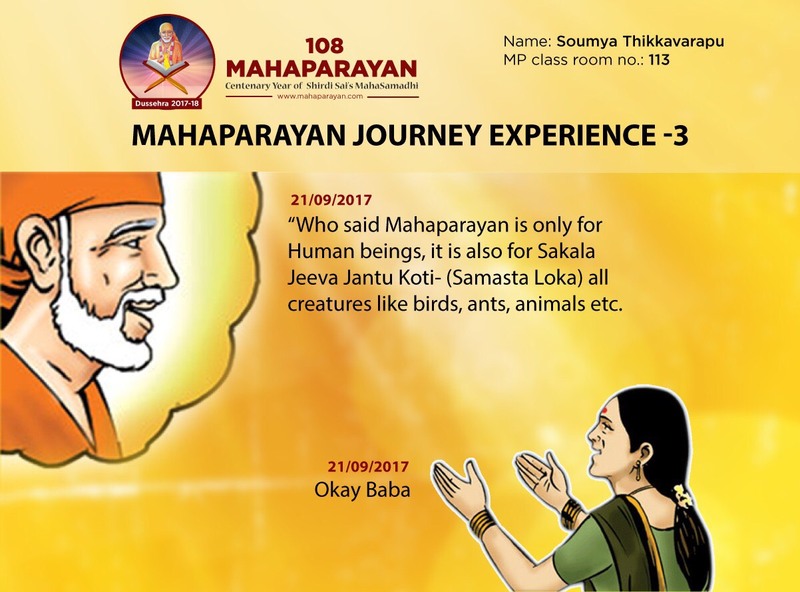 Sai Devotee Kanika Sahdev From India Says: I would like to thank my Sai Who has given this opportunity to us to make this Mahaprayan successful. I also want to thank Hetal di and wants to give my best wishes to her and her family. Because of Hetal di’s hard work, inspiration and encouragement we got such a wonderful platform to discuss about Sai’s leela which gives us lot of relief and strength. And thanks to my elder sister Pooja di for her faith, trust and Confidence in me. Also a big thanks to dear Kriti Ji for her beautiful creatives who converts all our Sai’s words into beautiful creations. And my special thanks to my mother Madhu Sahdev because of her only I was able to work late night, she is the one who remains awake with me for whole night and helps me a lot in Mahaprayan work. Last but not the least I want to thank my sister Honey Sahdev and my two besties( Kanika Dutta and Janki Soneja) whom I was not in touch for so long but with this Mahaprayan I came close to both of them and they both helped me a lot and all the devotees who helped us making this Mahaprayan smooth and successful. Sorry due to space concern I might not be able to mention all the names but I got so many beautiful relations through this Mahaparayan and I hope our bond would be for forever and it will be stronger day by day by Saimaa’s Grace. I would like to share my recent dream with everyone. From several days I was discussing with my friends that Sai Baba appeared in my dream so many times but He never spoke to me. So on Sunday night I got a dream from Baba where Baba was sitting on a surface and me and Pooja di were in front of Him. And Suddenly Baba spoke that always be together, never leave each other’s hand. Then I said Baba You know I consider her as my elder sister. Then me and pooja di went close to Baba and then He held both of our hands in His hands and joined our hands. And again He said, “Yaad Rakhiyo Ye Haath Kabhi Chodna Nahi, Me Keh Raha Hu Na Bus Yaad Rakhna Hamesha Or Dekhna Phir Sab Bahot Acha Hoga”( remember my words be together and never leave this hand, I am saying so just remember always and you will see in future everything would be alright.) Then me and Pooja di hugged each other. Then lot of things were in mind that I wanted to ask lot of questions from Baba, so I told Baba I want to ask so many things from you. He said Ok. So the first question I asked Him about my dear friend as she was very tensed due to some personal problems so He said tell her everything will be alright soon so do not take tension. So I was very happy after hearing the answer from Saimaa and suddenly I woke up and I realised that I was not able to ask about myself. But later on I understood the main reason of this dream. On Monday morning when I woke up I was very happy to tell my dream to my mother, Pooja di and my friend. But in the morning I was supposed to go to the temple first. So I was very confused whether should I go to temple first or should I tell about this dream to Pooja di. But Our Sai’s leelas and timings are perfect. The moment I came back from washroom, Pooja di had called me and my mumma told me Kanu(my nickname) pooja is calling. I said mumma please pick her call and Baba solved my confusion. Then I told her about the dream and she was very happy and she told me I want to hug you. I said I am feeling the same. Then she told me that she was very tensed due to some reason and she was saying Baba that He had not given her any gift as she had heard so from many people texting her after Mahaparayan had started and now He had given her me as a gift to her as a Sister. Everytime I used to tell Pooja di that you are like my elder sister, anytime you need my help please let me know and Pooja di always told me Kanika you are my right hand, without you it would have been very difficult for me to manage Mahaprayan work and so Baba has sent you in my life and blessed me. Even she told the same to my mother. Infact Hetal di also told the same to me and Pooja di. And Now Sai Baba also had given this confirmation in my dream. Then Pooja Di told there were few more things which Baba was inspiring her to take up since last night. But she felt how could they be accomplished as she felt they were still very challenging and difficult than Mahaparayan. Pooja Di said that she knew if Baba wants to get them done He would send many angels of His in her life and I was one of them. Pooja Di felt with this dream to me, Baba had doubled her strength and given her another positive sign to march ahead. Pooja Di said that she felt that Baba wanted to convey that with this collaboration (I and Pooja Di) many good projects could be undertaken under the shelter of Baba’s blessings. I could feel the tears in her eyes seeing this leela of our dear Baba. And on other hand my friend was very tensed she decided to leave SAIMAA 9 days Parayan (this is the different parayan which I have started there is also a story behind this Parayan as my friend was very tensed about some problem and we were taking over the phone whole night so I told her do not worry we should start 9 days Parayan where all 9 people will prayer for a particular person for 9 days and this way we will do prayer for every individual for 9 days and Baba will definitely fulfill our wishes so I called to all the nine people and they all were agree and I told Pooja di also we are starting this from tomorrow onwards so she told me do not start now start from thursday onwards as there is lot of Mahaprayan work which you need to handle then I said no everyone is very much excited to start this parayan so I will manage all the work so do not worry even Baba does not want us to start Parayan from that day. As we started the Parayan and on first day of Parayan one of devotee called me and she said I was not aware that for whole 9 days we need to pray for a particular person I am sorry I am not able to pray for 81 weeks for everyone (although its not 81 weeks but many more confusions arose) and some other people were also confused so we had to stop our Parayan on that day and then on next day me and my best friend her name is also Kanika (Kanika Dutta) decided that will do this Parayan for 9 days only and every day we will complete whole Sai Satcharitra and pray for each person every day. In this way Baba introduced us new kind of parayan. We have so many kind of Parayans which me and Pooja di will share soon on Mahaparayan website) As I told my friend had decided to leave the group and I was not aware about this. After I came back from temple, I called her and told her about the dream that I asked Baba about her in dream and so she was very happy. 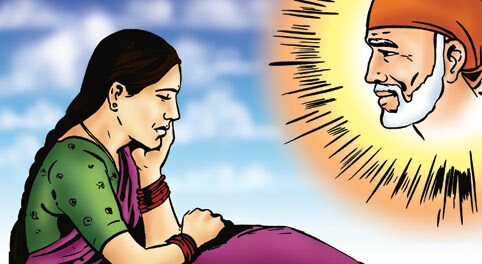 As she was very tensed that Baba did not listens to her and felt nothing works so felt like not to read. I said see I was not aware what was in your mind But Baba knows everything that’s why He came in my dream and told me about you, So please do not worry it is a very good sign and He wants You to continue this parayan. So she agreed. I was very surprised in one dream. Baba solved all the problems as He spoke to me, given the gift to Pooja di, blessed me with elder sister and solved my friend’s problem. I can not express my feeling I was so happy after this dream. I just pray to my Saimaa that please fulfill all the wishes of Your devotees and give them all the happiness.Sorry for long post. Thank you so much everyone for all your support and help. Sai Sai Sai Sai Sai Sai Sai Sai Sai. I feel honored to be given this opportunity to pen down first post of this blog – Experiences of MahaParayan. I am very much thankful to Lord Sai Baba for inculcating idea of MahaParayan in Sai sister Pooja. Her soul is very selfless and pure, thus I feel He chose her. While discussing matter with regards to this experience, when it wasn't resolved, she showed her confidence on Lord Baba that He will take care of it and somehow we would witness fruits of MahaParayan. So she said if problem gets resolved, she would like me to inaugurate this Experiences of MahaParayan Blog with my experience. On her insistence and thereby reciprocating her feelings towards me, I start my experience. Lord Baba, You always write making me medium, kindly do so this time as well. All happenings are of few days back, just a night before we started MahaParayan and that too BMP Khichadi 4 AM on Dusherra of 2017 (September 30). A day before it, i.e. September 29, I worked on blog till 4 PM and then got busy with my son Krishaang’s studies. I had an unexpected guest at home for dinner and all were done with it except me. I just took my plate to have dinner and Pooja called. She informed me that our blog (Devotees Experiences with Shirdi Sai Baba) is not working and someone from USA had just dropped message on Whatsapp to her regarding the same and he is willing to help in whatever way possible. She took my permission to share my number with him and asked him to call me. I realized what had happened and was clueless as to what will happen next. But Lord Baba has pre-planned things and happenings well in advance, two months back! July 18, is my mother’s birthday. It was planned to go to her place after Krishaang returns from school. When he got down from bus he seemed cranky and upset. To cheer him up I told him, “Yay, we are going to Aaji’s (grandma as called in Marathi) home. Usually he jumps with joy on knowing this but he gave me plain NO to go. I was surprised but still couldn’t believe that and told him to stop throwing his silly tantrums and we needed to rush. After reaching home he lay down on couch and started crying hiding his face. Now I was tensed. I asked him what happened; he said his teacher hit him at school. I couldn’t believe him again as now a days students of pre-primary are not even scolded then a beating was totally out of question. Though his teacher is little strict and shouts in anger which scares kids but I consider that necessary to handle hyper-active kids counting to 25-30 numbers in a classroom. I repeated same question in different manner and trouble shot to every possible aspect but his answer was the same. I was now frightened, tensed and worried to the core. Today’s kids are not even safe at school owing to child abuse cases, what if he was a victim to it, was he really beaten and such negative thoughts were surrounding me. Surpassing them, I somehow managed to convince him to go to my mother’s place where he wanted to sleep on reaching. When he woke up he was still upset and down with fever. I and my father took him to hospital as we felt it’s high time for diagnosis (and/or counseling) as he was not active as usual and did not eat anything after he returned from school. Doctor said it was throat infection and nothing to worry. While taking medicines from the store, my father did not have enough change. So I offered him my credit card while Krishaang was insisting me to pick him up as he was feeling weak. My father said he will first try to get change, if person denies he will use card. I took Krishaang near two wheeler and made him sit on it. My father returned with medicines and we returned home. After a week i had to go to grocery store. That time I searched my wallet to take out my credit card, I couldn’t trace it. All pockets were emptied but no luck to it. Recalling incidences I realized that I took out my card outside pharmacist store the last time. My father remembered returning it to me but I was totally blank. I felt may be I have dropped it on road thinking I am keeping it in my sling without noticing. He was confident but I was not able to remember that part of the moment even after repeated thinking and trials. Two days I spent in searching card in all my wallets, slings, handbags, drawers and what not. Recalling incidents of using it last time was making me more depressed as Krishaang wasn’t well, but what was haunting me was the beating he said he got at school. The same day when Krishaang was taken to hospital, I called up his classmate’s father who is in turn my school mate. He told me that Krishaang had not got any beating but his son was scolded for not finishing his meal. As we discussed the matter we even predicted that teacher might have touched his cheek gently but in anger and so he took it as a beating, but we couldn’t conclude anything. However we decided to catch hold of parents of their classmates in school over phone or social media personally and ask if same case was with their kids. We got in touch of few parents and received reports like their kids complaining about teacher scolding in loud voice and also they sometimes did not want to go to school. I was more tensed as with so many pros and cons we decided on a school for Krishaang and when such consequences come forward, as a parent it’s a moment of high alert. However when I discussed whole matter with my husband he said we first need to take care of Krishaang’s health and we can get into school issue later. But back of my mind I was restless. After few days my school mate talked over phone with head of department in school and she took necessary action, the issue stands solved now. If Krishaang wasn’t sick, this matter could not have come to our notice and that Lord Baba took care of brilliantly. Now, no hopes of credit card to be found were seen, so I asked Lord Baba via chits to block it or not. His answer was Yes and I did it in no time. But I was afraid that my husband would get another chance to note down my carelessness. However when he came to know this and my state of mind when I lost card, he said nothing but confirmed from me that I have blocked the card properly. He works in bank so I am always lazy at bank works and never try to peep into its process. The re-issuance of credit card did not affect anything except one. Technical readers must be knowing that a domain has to be renewed every year and when I started getting reminder emails from one of the blogger (actually it’s a service by Google) companies regarding renewal, I tried to log into the account (which I was doing from past 9 years) to update billing settings as my credit card had new credentials. I was unable to do so. I tried several times for few hours but could not get through. I was tensed because that was the only way to renew domain otherwise it will go in auction or some other person or company can buy it at premium rates. In anxiety I called Pooja, though she wasn’t aware of such technical aspects, she heard me patiently and even replied I don’t have credit card otherwise I would have given you, very innocent answer from her. But then I explained her that credit card wasn’t issue, but changing credentials while logging into it was. However we both didn’t have any solution and I decided to leave it to Lord Baba and also shared with her that after hanging up the call, I will ask Lord Baba regarding another domain which was similar to the present one, if He replies affirmative, i will do the needful the same day. But Lord Baba's answer was No and i thought He was the saviour and i need not worry at all regarding this issue now. I told Him that I have put all my burden on Him, whatever He does i agree to it. Till September 29, it worked well as I shared in opening of this write up it was working till 4 PM. Now Lord Baba starts His Absolute Sport. Sai brother Rohit was assigned this task of retrieving expired domain by Him. He was on continuous call with Google service people with credentials I remembered. But he couldn’t complete the task on the same day and then it was weekend. Not sure how he did but I feel it was a hard time for him to be on calls and follow lengthy process which required lot of patience. However he was stuck many times in between because of opposite time zone and few details were to be provided only by me. With grace of Lord Baba and his continuous efforts, our case was escalated on high priority and Google representatives were in constant communication via email. Once a domain expires it is never possible to get it back, but Lord Baba did this impossible thing through His devotee and our blog is live again. Seriously in these nine years I have never faced such a situation that I can’t see light at the end of the tunnel with regards to blog. I have always handled technical aspects and I knew it’s not possible to retrieve any expired domain, but Lord Baba did it within one hour of getting password reset link from Google.